When you collect your paycheck, you know that Uncle Sam has a hand in that transaction. Not only are the taxes you owe automatically deducted from your pay, but you know that your income is automatically being reported and tracked. There will be no hiding what you made come tax time because the IRS already has a record of your income for the year. However, there are times that you may get a little extra cash that isn’t automatically being reported to the tax man. Maybe you watch kids on the weekend for pay, or maybe you sell your crafts at local shows. When you make money that is not automatically reported to the IRS, this is known as unsourceable income. Since this income is unsourceable, taxes are not automatically deducted from it the way they would be by an employer. That means that you will be responsible for paying federal and state taxes, social security taxes, and other taxes yourself. If you have a significant amount of unsourceable income — such as income that is paid in cash — you will need to pay estimated taxes through the year. You must determine how much tax you are likely to have to pay based on how much you expect to make for the year, and you must divide that amount by four and send in payments every three months. The IRS allows you to calculate your estimated taxes on their website, and many state tax agencies have similar features on their websites. However, the best way to determine your estimated taxes is to talk with a certified public accountant or Fountain Hills tax lawyer. Your tax professional will look at your whole financial situation to determine your total estimated income and deductions. For example, you might have other income for which you will be responsible for paying the tax, or you might have business deductions that can help you lower your tax obligation. You may also be responsible for paying more taxes than what most workers typically pay. If you have unsourceable income because you run a sole proprietorship — such as yard services where you are mostly paid in cash or check — you will have to pay self-employment tax, as well. Your tax professional can help you understand all your tax obligations so that you are paying the right amount and aren’t met with any unpleasant surprises at the end of the year when you are filing your return. You can make payments online or through the mail, and you can print out a payment voucher showing your estimated payment. If you want to pay a flat amount each quarter, your tax professional can also print out these vouchers for you. If you wait until the end of the year to report your unsourceable income and to pay the taxes owed, you could be looking at big penalties. Failing to make estimated payments means that you will have seriously underpaid your taxes for the year — a practice which is fined by the IRS. Working with your tax professional to determine your tax and then making timely payments will help you avoid these penalties. Of course, failing to pay taxes at all on your unsourceable income can land you in some serious legal trouble. You may feel that since your income is unsourceable, the IRS will never know that you failed to report it. However, the IRS has other ways of figuring out that you have generated income besides employer reporting. It can look at your bank deposits and standard of living to know that something isn’t quite matching up with the return you filed (or failed to file). Generally, you have to be committing fraud on a pretty big level to attract the attention of the IRS like this — think Tony Soprano living in a mansion but not reporting any income. However, it’s just not worth it to take the risk. Always work with a tax professional to report all your income and to pay what you owe. Sometimes, you may make mistakes without realizing it. Maybe you didn’t know to report the money you made on that mega yard sale you held or the car you sold. But ignorance of the law is not a defense of it. 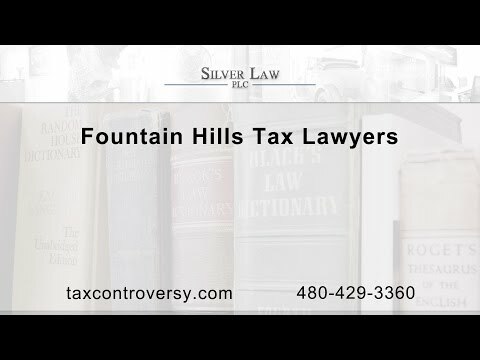 If you find yourself in hot water, the experienced Fountain Hills tax lawyers at Silver Law PLC are ready to help. We represent clients in civil and criminal tax litigation and help them with audits, offshore tax reporting and other tax matters. Call us in Arizona today to get help with your tax issues.